Beijing is the capital of China and also an important transportation hub of China. 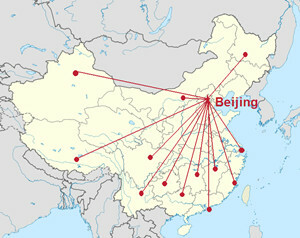 There are many international and domestic flights taking off and landing in Beijing every day. Tourists can go almost everywhere in China from the capital. Besides Beijing, Xi’an, Shanghai, Guilin, HK etc. are all popular tourist destinations. The following pages will talk about How to Travel from Beijing to Other Cities in China. We ChinaTour.Net offers reliable tour service. You can book a tour, flight or hotel with us.We will do our best to make you a smooth trip.